I have posted about "Design-Build" relationships before and feel compelled to post about a very recent, highly successful Design-Build project that I was teamed with architect, Sissy Austin, AIA, on. This project arose when great clients of mine approached me regarding the feasibility of re-claiming a very unfriendly basement and maximizing the use of the space, following an interval between building a unique terrace and limestone outdoor fireplace for them. The house is in a very nice neighborhood and the new basement project could sustain a relatively flexible budget/investment if properly designed. Due to the various ranges of complexity with load bearing systems, waterproofing, lighting, and space, among other details, I didn't hesitate directing my clients towards consulting with a professional architect. Fortunately for everyone, Sissy was friends with my clients and had an interest in taking on the project. The Design-Build team consisted of the owner/clients, Sissy, and I. A study was made of the existing space, needs and comforts were discussed and weighed upon, a design produced and value engineered, and a very enjoyable project was completed thereafter. The basement was primarily below grade and extensive excavation and waterproofing was made. Playroom with durable carpeting, built-ins, and plenty of run around space. One of the design features was to achieve a full 8' ceiling height throughout and we removed the old, uneven slab and almost a foot of soil before re-roughing the plumbing and installing a professional foundation system with a sump pump in the new mechanical room. Sissy's style, and design achievements, were to introduce more natural light, provide an elegant industrial feel to the finishes, create a very comfortable laundry/cleaning environment, full spa-like bath, and space for the children to spread out in. The other "adult" comforts are a custom walk-in wine cellar, and a spacious carpeted den with a large flat screen television with surround sound. Sissy and I met and worked with skilled craftsman from Birmingham to Montgomery on site and in large and noisy fabrication shops throughout the winter searching and collaborating, and installed specialty items ranging from bluestone flooring to custom designed, handmade steel doors transforming a stereotypical "dungeon" into one of the coolest spaces in our client's home. 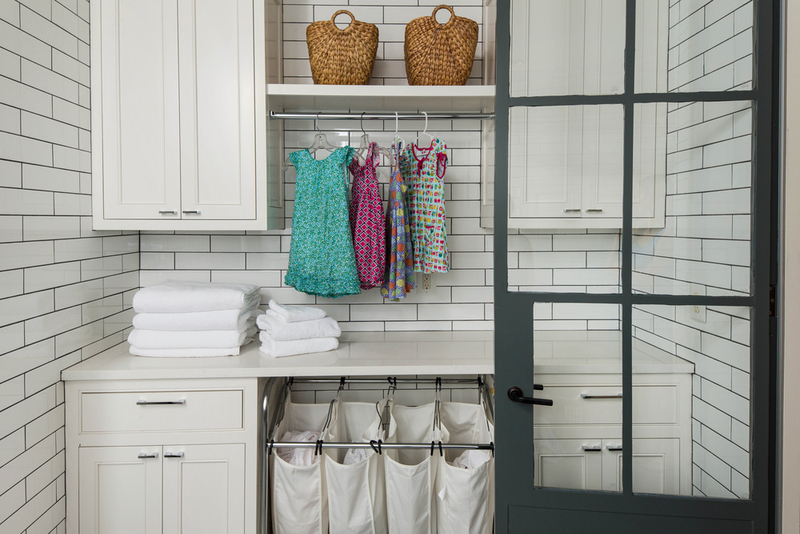 Full laundry with floor to ceiling tile and opposing wall Service Space. Sissy and I are working on another "Design-Build" project now, and I believe that the non-adversarial and open dialogue during the preliminary design stage, and throughout the course of construction, is the crux of the Design-Build process and is enjoyable for all of the parties involved through its team orientation. Every aspect of pricing, accounting, design changes, etc., were always transparent, and we strived to "value engineer" for the best products at the best price point, resulting in pleased clients, a great product, and lasting relationships. Walk-in wine cellar with cyprus paneling, steel/glass door, and stand alone climate control.